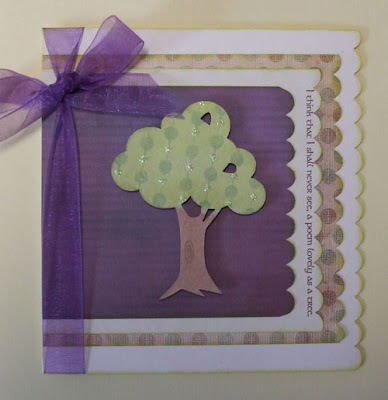 This is a fabulous card by Karen using the smaller of the 2 tree designs that were first showcased HERE. 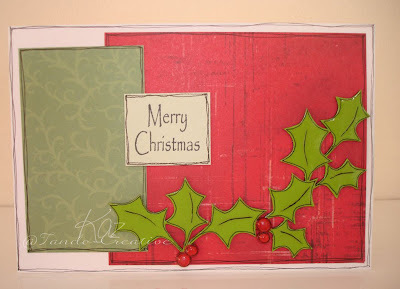 Karen has used chalk ink first of all and then overstampled the tree dotting stickles over the stamping. 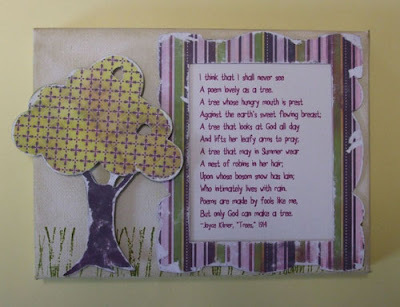 It was mounted on to the super DCWV papers and she has added the first line of that lovely poem she used on the canvas.....a gorgeous card. We have some really interesting bindings. They are made of polypropylene and come in 3 really funky colours. They can be held on to your projects with special clips that will be available separately or you can use brads to secure them on. Here they are in their "undecorated" state. 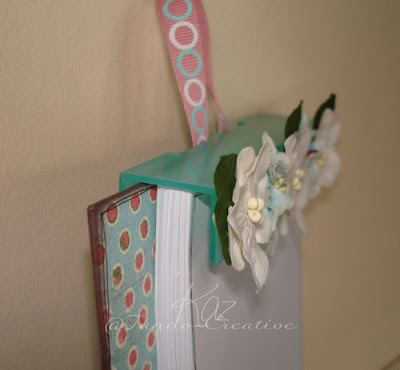 Kaz has made this gorgeous To Do list holder, the paper sits beautifully on the binding and it can be unclipped easily to add more pages when necessary to make a long lasting gift for anyone. 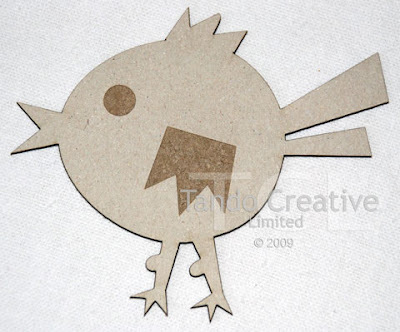 Kaz has also used one of our new designs, the cartoon birds, that come in a pack of 2 sizes. He has been covered in paper and, Kaz's lovely style, has been doodled around the outside. A shaped wing has been glued on top. Lots more coming over the next few days. Don't forget these and other designs will be available soon as we have our first stockist now....Bubbly Funk. Look out....there's a blinkie about. Ok, if any of you lovely peeps fancy putting a Tando Creative blog blinkie on your blog feel free to copy and paste the code in the left hand column. Or....until this post disappears, you can use the code below. 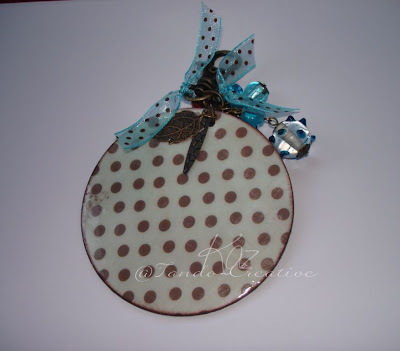 The first of our Christmas Bauble designs. 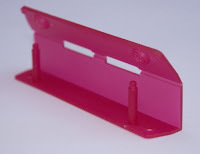 These measure just over 50mm across so are perfect for cards. 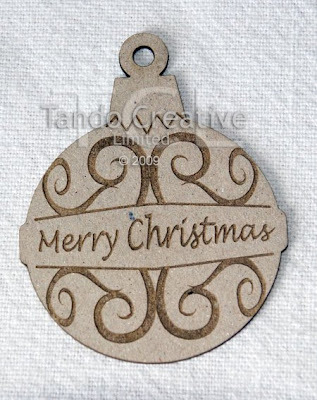 The swirls and greeting have been delicately engraved into the chipboard. Kaz has done this super sophisticated card, I'm loving the black and gold combo on this, it's gorgeous. 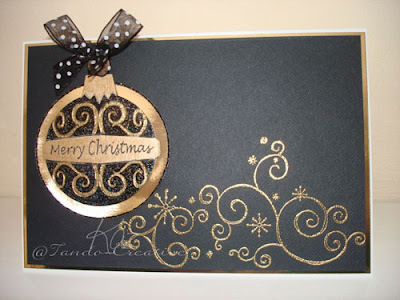 She has used black sparkle embossing powder and gold paint and picked out the swirls with gold embossing powder. 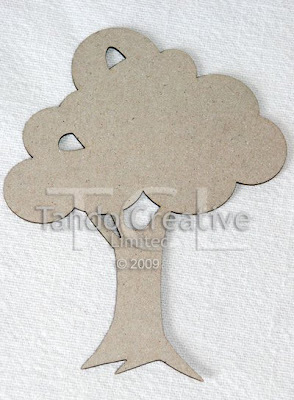 This cloudy style tree comes in packs of 2 sizes. 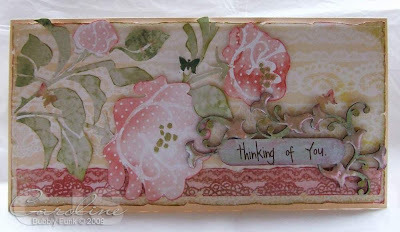 They are robust pieces and well suited to the fabulous canvas that Karen has created. The tree has been covered in paper and given the shabby treatment. 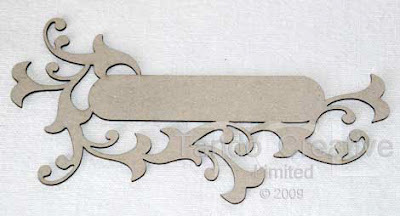 It is a perfect addition to the distress inked canvas. What a fabulous piece to have hanging on your wall. 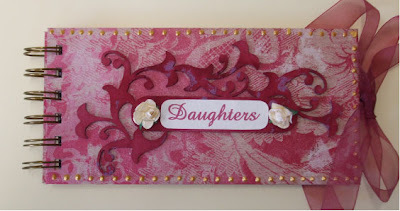 Another make with the word block flourish found HERE. Kaz has used black glitter embossing powder and white acrylic paint, she then finished off with a rub on to make this stunning card. Another design not seen yet. 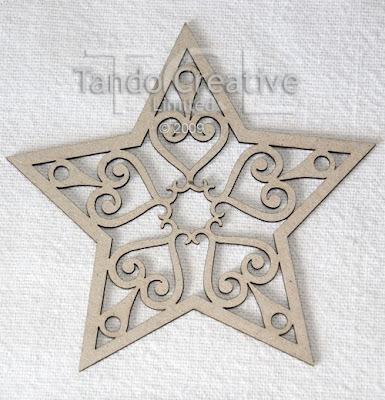 This intricate Christmas Star could be used at any time of the year. 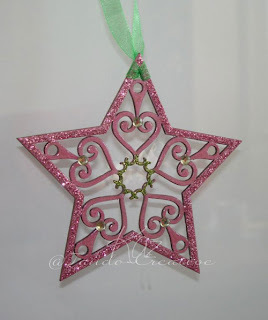 Kaz has done a fabulous job by using Glimmer Mist, Glossy Accents, Gems and Glitter to make this a perfect decoration for her tree. 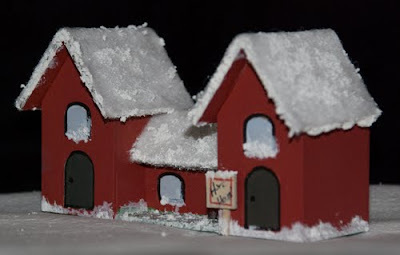 The first of the village models coming up here. This one is the pub/hotel, but the range will develop into a complete village. I've based mine on a snowy scene with the ever growing ambition that I'll actually finish it by Christmas. The little kits comes flat packed in pieces complete with instructions to put it together. This particular piece should be ready for release early October. This one has been painted with acylics and the windows have been coated in glossy accents. 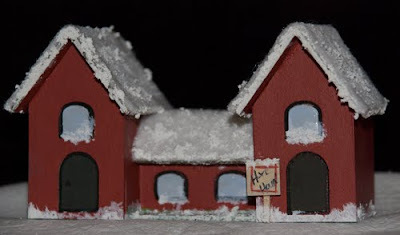 White felt and Snowtex has been used on the roof. The outlines of the windows and doors have been engraved so it's easy to run a felt tip pen around the groove to emphasise them. This shot is to indicate the size of the piece. This is a card for a friend who's birthday it was recently. 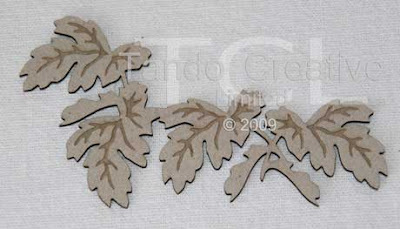 I painted the chipboard flourish with green paint and picked out the engraved detail with a sharpie pen. It is very easy to pick out the detail on these pieces as the engraving is deep enough to stop the nib of a pen from going off track. 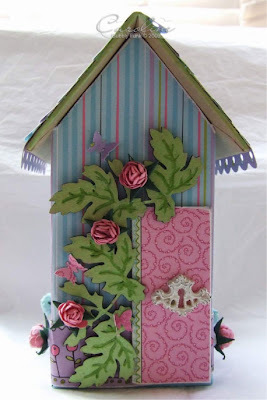 Caroline has made this stunning house using the Leaf flourish chippie that was showcased HERE. It has simply been painted in Pearl Green acrylic paint with the engraved detail picked out with a Copic pen. Caroline has mentioned that this is a work in progress but I think you'll have to agree it is a beautiful piece just as it is. 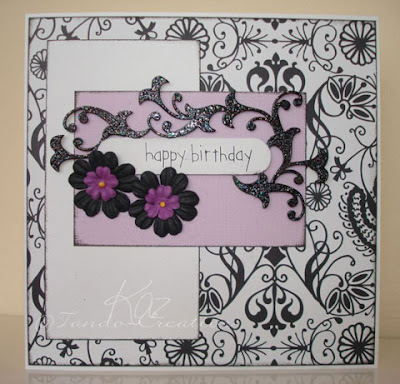 Another gorgeous example of our Word Block Flourish, this one done by Caroline. This has such a lovely Vintage feel to it. You can see the raw chippie piece HERE. Caroline covered the chipboard in an antique white Rub 'n' Buff paint, which when dry you can rub and it goes shiny, it works particularly well on chippie. She then inked lightly with a green and red ink. The flowers are triple embossed with gold embossing in places too and a rub was added for the finishing touch.....fantastic. 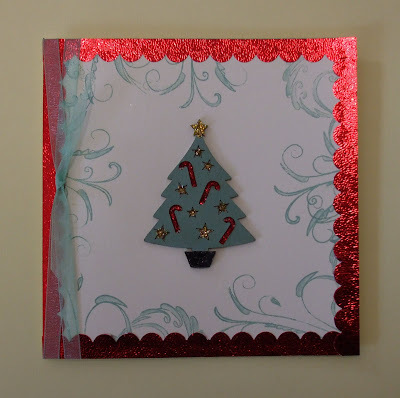 HERE is the first thread for the Christmas Tree chippie, it comes in 2 sizes and Kaz has done this fab card. 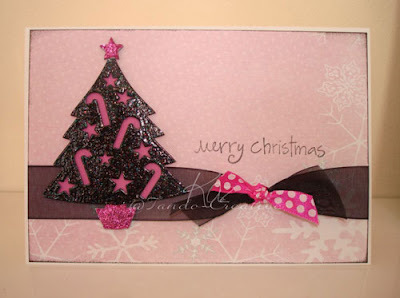 I really love the pink and black theme for Christmas, it's so different from the norm. 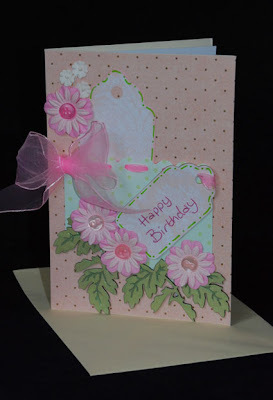 This one has been been covered in black sparkle embossing powder and some glitter was added. 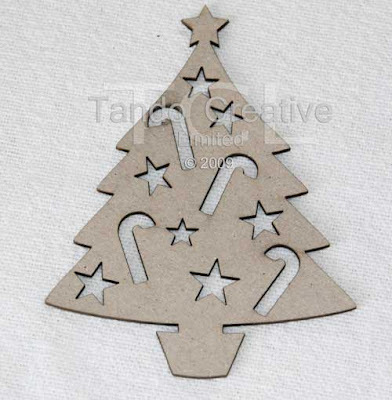 These Christmas trees come in 2 sizes, the shapes within the tree have been cut out to be left as is or to be filled as Karen shows you in her fabulous project below. Karen has inked the tree and filled the cut out areas of the chippie with different coloured stickles to give a really gorgeous festive effect. 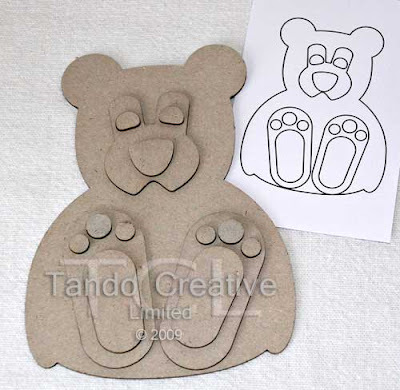 Now these are real cuties, the larger 3D type bear is made up of layers, one for his body and further layers for his face, eyes and nose and feet and feet pads. 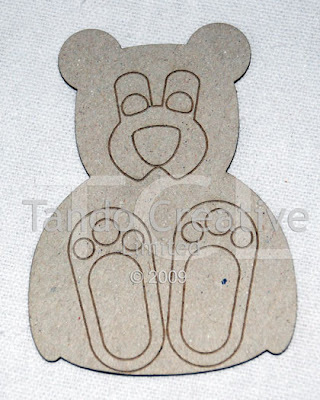 This little fella is about half the size of his bigger brother above and rather than the 3D effect the face and feet have been engraved into the chipboard. 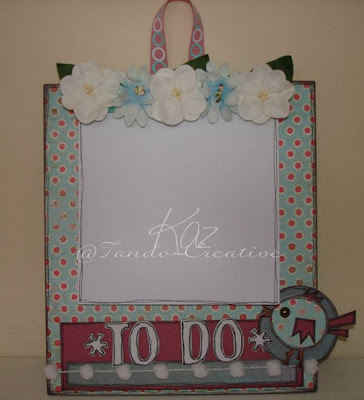 Kaz has done this stunning canvas and co-ordinating card. Big ted has been covered with patterned paper and painted with acrylics whilst little ted has been painted, also with acrylics. They were then coated with varying thicknesses of glossy accents to add dimension. 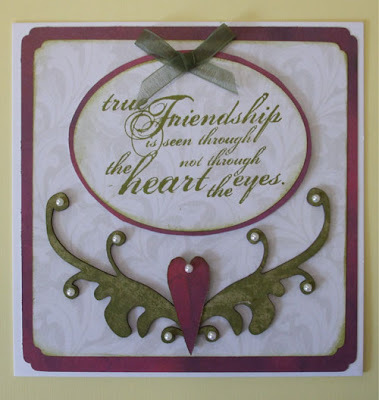 These heart flourishes come in 2 sizes and Karen has now decorated the second one. You can see her first project HERE. This one has been beautifully embossed in gold and added to this stunning notebook. 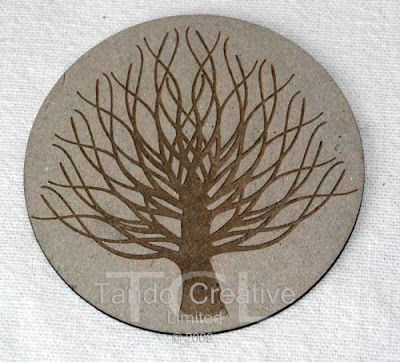 These engraved tree plaques come in 2 sizes 80mm and 55mm in diameter. Karen has inked hers and glittered the engraved tree to really make it stand out. 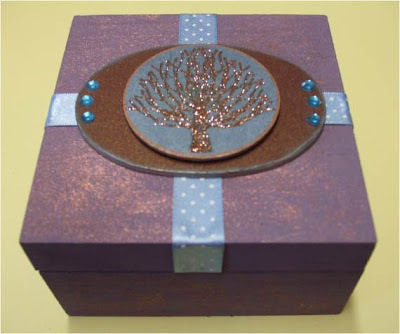 She has added it to this gorgeous box, doesn't it look stunning! Kaz has made this fabulous bag charm. 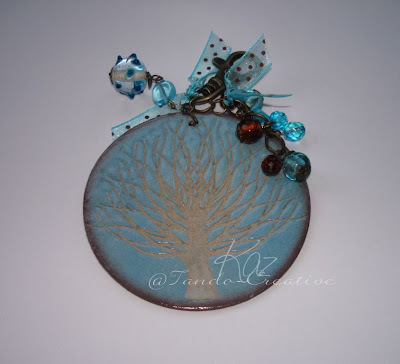 She has inked and covered the front in glossy accents leaving the engraved tree natural for a stunning effect. 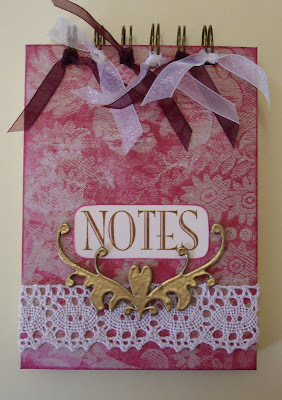 The back has been covered with patterned paper and glossy accents and the whole piece has been finished off with beads and ribbon. 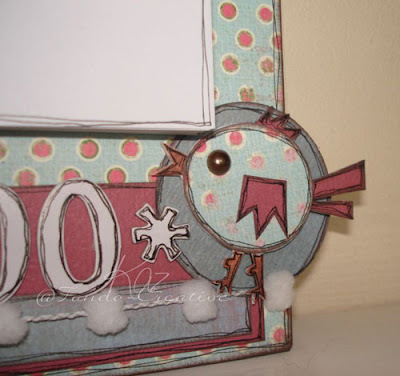 Next up is a useful word block with a flourish around the outside. Karen has simply inked this but added the 2 gorgeous blooms and the title for a gift she is making.....absolutely stunning! 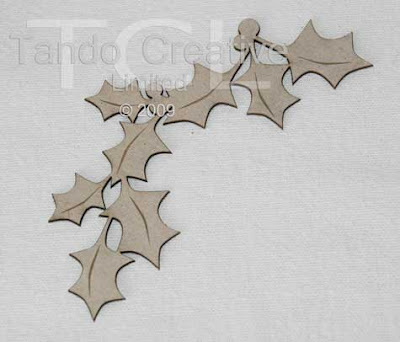 The first of our Christmas Range is this delicate holly flourish with engraved veins on the leaves. Kaz has used acrylic paint and doodled to emphasise the leaves and berries. She has then coated them in glossy accents but added extra layers on to the berries to make them stand out. A beautiful card for Christmas. These flourishes come in 2 sizes. 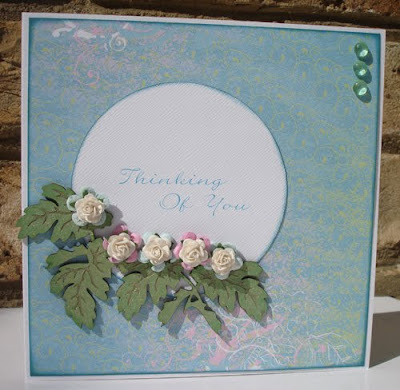 Karen has made this beautiful card, she sponged the flourish with distress inks & overstamped. Then the heart was drawn around & recut in the red to emphasise the heart on the chipboard, fantastic! 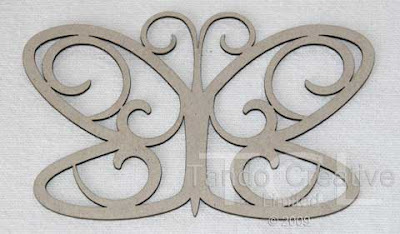 These butterflies come in packs of 2, a large and small one. 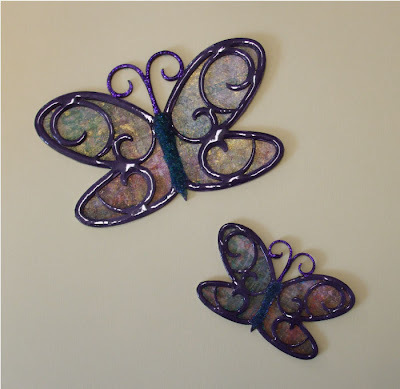 Karen has done a fabulous job on these butterflies. They have been backed with gold glimmer misted paper, then covered with glossy accents, adding micro beads on the bodies and stickles have been used on the feelers. They would look great hanging on a wall! 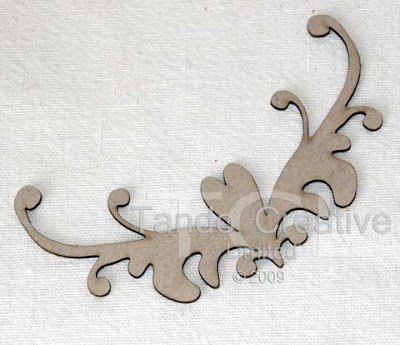 The first of our products to be introduced, a beautifully engraved leaf flourish. And below you can see the stunning design by Kaz. 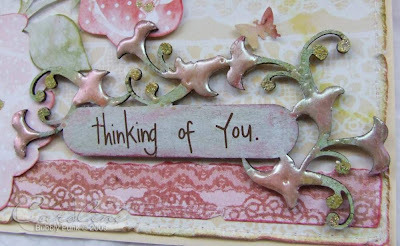 The leaf flourish on her Thinking of You card has been simply sprayed with Glimmer Mist to produce a fantastic effect. Our new and exciting company will be launched soon. Be sure to check back regularly to see our range of inspirational products.